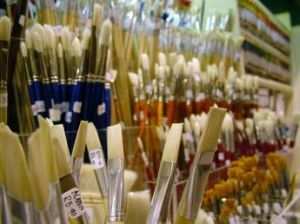 What Oil Painting Brushes Should You Use? The most popular oil painting brushes are bristle ones. The most commonly used types are the longhaired brushes known as a "flat" and the short-haired brushes known as "bright." There is also a round bristle brush that comes to a blunt point, which you may find useful after you have become familiar with the possibilities of the long- and short-haired varieties. These come in sizes from a scant inch to over 1 inch in width and are identified by numbers. While I suggest inexpensive student colors for beginners, I recommend that you buy the best brushes you can afford. Properly cared for, a good brush will hold its shape and resiliency and will last a long time. In the Oil Painting Tips and Tricks section I include advice on the care of brushes and the use of other types of brushes. 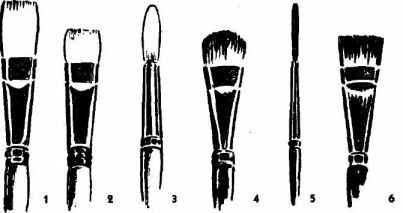 Long-haired brushes numbers 2, 4, 6, and 8 Short-haired brushes numbers 4 and 6. In addition to the bristle brushes, you may find a small pointed or round sable brush handy for fine lines and details. No 1 Flat: The long-haired bristle brush known as a "flat." It will serve for the bulk of your work. No 2 Bright: Also a bristle brush but with a shorter hair. Using the edge of the brush produces a thin line, excellent for outlining. No 3 Round: The round brush is available in both bristle and sable hair. It does not hold much paint but is useful for details. No 4 Filbert: Combines the characteristics of a flat and a round bristle brush. A very fluent stroke, particularly useful for head and figure painting, can be produced with it. No 5 Rigger: Made with sable hair, the rigger is used for delineating fine lines and sharp details. The flat sable is the most effective brush for producing a smooth finish. Its soft quality lends itself well to glazing effects.